The Utah Bill of Sale Forms are legal documents designed to provide information regarding the legal sale and purchase of various items. The forms will usually provide information regarding the seller, buyer, identifiable information about the item being sold as well as proof that there has been a change of ownership. Some forms will require notarization. 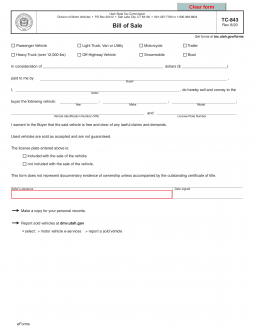 Automobile/Motorcycle Bill of Sale – This form will be used to prove the sale and purchase of either a motorcycle or vehicle in the state of Utah. Boat Bill of Sale – Use this document to prove the legal sale of a vessel/boat. General Bill of Sale – This form is generally used between two private parties to prove the sale and purchase of personal property. Firearm Bill of Sale – The use of this document will prove the legal sale and purchase of a firearm in the state of Utah. The following forms will be needed to bring to a DMV Office Location. You will be required to provide a validated tax certificate from the county assessor’s office to prove that you have paid the uniform age-based fee). Unless you have purchased a boat from a dealership, you will be required to provide a completed Certificate Of Inspection (Form TC-661). Be prepared to pay all titling and registration fees in cash or by check. Note*Motorboats, sailboats and any jet skis that are dated 1985 or newer must be titled as well.